Kampot, 캄보디아의 버즈 네스트 바 | 호스텔월드에서 예약하세요. 5 Hamocks and 4 beds for the group. 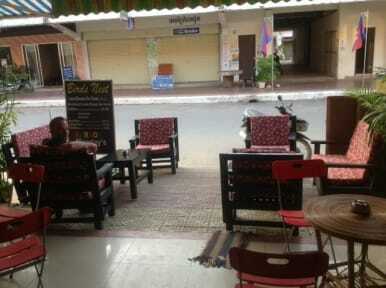 Birds Nest is located in the centre of Kampot. 40 meters from the River The Birds Nest has a great bar with fantastic local and western dishes.It is in the heart of the town, with plenty of other bars and restaurants very close by. WiFi is included. Birds Nest offers nice new rooms with new beds and linen. Towels are provided and anything we can help with we will. We have contacts with moto rentals, tours, and any other advice or services you may require. There Are 3 showers 2 on the roof and one on 1st floor. 4 toilette with 1 on first floor and 3 on main floor. There is a bar serving 75 cent beers to guests, as well as great food for breakfast, lunch, and dinner . The coffee is some of the best in town and very popular. We try hard to help our guests so please ask what you may need and we will try to point you in the right direction.